2. Guru Angad (1504-52). He is credited with the invention of Gurumukhi. 3. 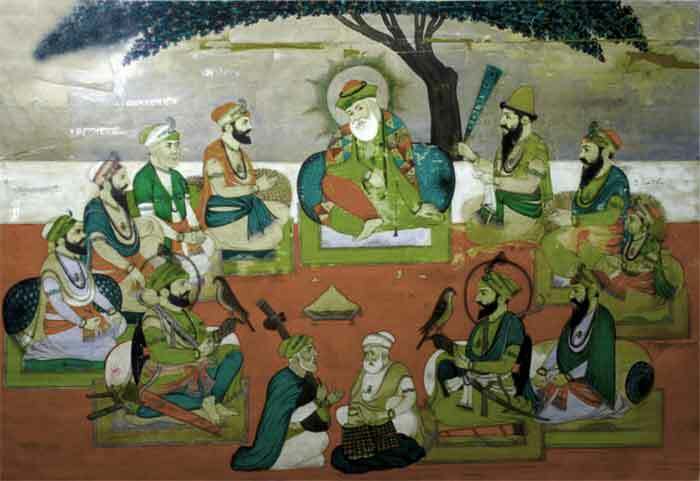 Guru Amardas (1552-74). It is said that he originally started the tradition of Langar, the social kitchen to remove caste distinctions and establish social harmony among his followers. 4. Guru Ramdas (1574-81). He was the son-in-law of Guru Amardas. He founded the city of Ramdaspur, which is now known as Amritsar. The construction of Guru Harminder Sahib (the Golden temple) began here during his time. 5. Guru Arjan (1581-1606). He was the youngest son of Guru Ramdas. He compiled the Adi Granth which is the most important segment of the Guru Granth Sahib. He made Sikhism very popular during his life time and there by attracted the attention of the Mughal Emperors. 6.Guru Har Gobind (1606-45). Son of Guru Arjan, he perfected the dress code introduced by his father and started the tradition of wearing two swords, one signifying his political (amiri) authority and the other his religious (fakiri). He tried to organize the Sikhs and the Hindus against the Mughals for which he had to face the wrath of the Mughal Emperor, Jehangir. 7. Guru Har Rai(1630-1661): He supported Dara Shukoh, the elder brother of Aurangazeb in his conflict with the latter and had to pay dearly for it. His son was held hostage by Aurangazeb and Har Rai could not secure his release. 8. Guru Har Krishan (1661-64): He was the second son of Guru Har Rai, who succeed his father at the age of five under unfortunate circumstances since his brother was taken away as a hostage by the Mughals. The Mughal Emperor summed him also to Delhi and he died shortly thereafter at the age of eight. 9. Guru Teg Bahadur (1675-1708): Though he was able to spread Sikhism to a greater degree, Sikhism also suffered from schism during his time. Aurangazeb executed him for his defiance of the Mughal authority. We are told that when he was in the prision awairing his execution, Guru Teg Bahadur predicted the coming of the Western powers to the Indian subcontinent and the downfall of the Mughals. 10. Guru Gobind Singh (1675-1708):He was the tenth and the last Guru and also the most famous after Guru Nanak. He was born at Patna. Because of the execution of his father, he became the Guru at the age of nine. He organized the Sikhs into Khalsa to oppose the tyranny of the Mughals. He began the tradition of adding the suffix 'Singh' to the names of the Sikhs. He introduced the baptism of the sword, abolished the succession of the Gurus and made the Guru Granth Sahib the symbol of the Guru himself. He spent most of his time opposing the Mughals to whom he lost his two sons and finally he himself was assassinated by a Pathan at Nanded in the present day Maharashtra. Swami Vivenkananda called him rightly "the most glorious hero of our race."